Mana fixing early, tutor for any creature later. Not necessarily a great card, but the cost is right. It is probably worse than Green Sun's Zenith, but it can get creatures of any color. If the first ability was not restricted to basics I think it would like it much more. I thought the same. If it was not to basics it would be 4x in oath with show and tell, to fetch for orchard or fattie. Maybe oath with s&t want it nevertheless, since it ensures early basic landrop (improving manabase) and later acts as a tutor (not only for creatures, also for orchard once delirium has been achieved). While misstep is a problem, most oaths should already play 4 because of cage imho. Delirium also is not ensured before oath activations (oath is not discarding creatures and it's not easy to get artifacts, pws or enchantments in the grave), so it needs testing. 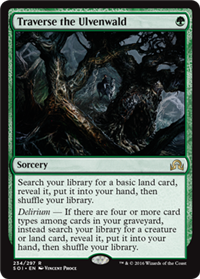 For creature decks seems worse since delirium is harder to get, normally I'd prefer a GSZ. Better than worldly tutor I guess. If it was not restricted to basic lands it would not allow you to get any land. That would be Crop Rotation level and they won't do that again. But, if it said "forest" instead of basic land, it would be much better.